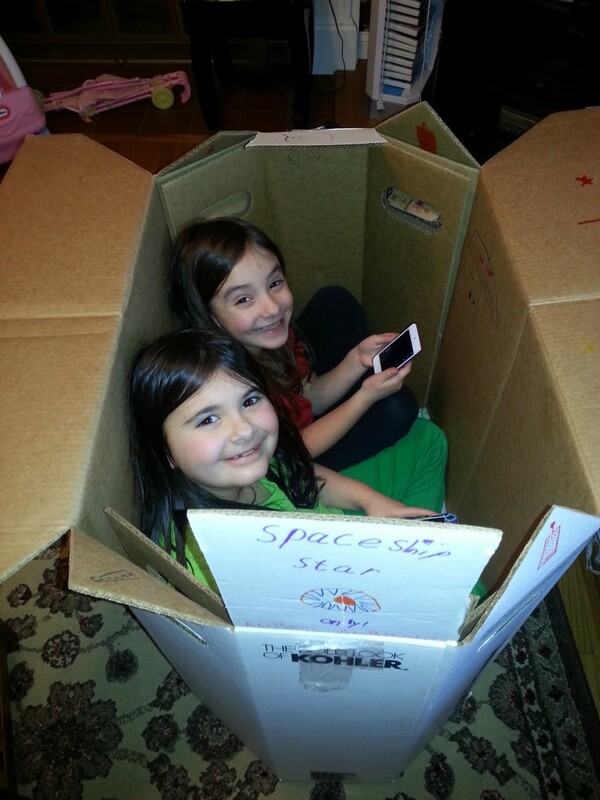 Hand Made Spaceship – Why Do I Buy Toys?? We got a new toilet this weekend and the girls got a new toy… all in one. NO They aren’t playing in the toilet but they ARE playing in the box that the toilet came in. Seriously these kids have enough toys to label them spoiled but yet they play with things that aren’t toys. But when they saw this big box, they knew it could be turned into something fun…………………. like a Spaceship! They got their markers out and began decorating and writing on their Spaceship and as you can see from the picture above it’s called “SPACESHIP STAR”. That is Holly’s handwriting! One the ship was complete it then became a hang out for the and several of their stuff animal friends and a place they could hang together and play on their iPods. It was cute how they both fit in there. And yes, we love our new toilet.